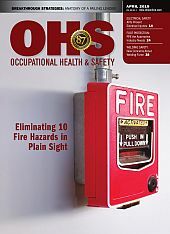 Welcome to the OCCUPATIONAL HEALTH & SAFETY reader service Web site. Use these pages to quickly find and request free information on the products and/or services found in the pages of OCCUPATIONAL HEALTH & SAFETY. You can ask companies to provide you with more information or link directly to their web site. LION Clean. Safe. Effective. Realistic. Royal Products Oil Mist & Smoke in Your Shop?